Can there be anything more evocative of the Portuguese soul than the plangent sound of the 'guitarra'? It is the musical evocation of that most Portuguese of words 'saudade'. 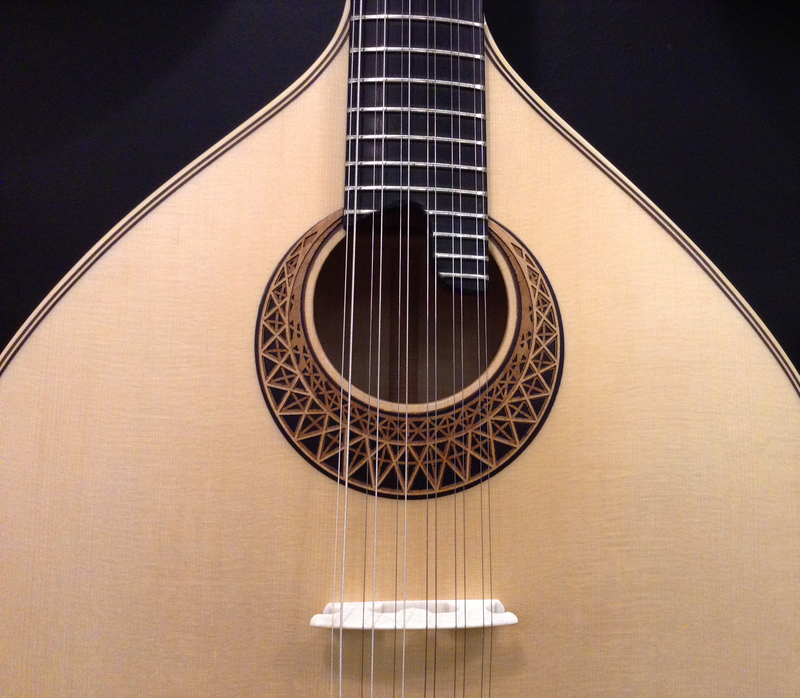 To find out more about the meaning of 'saudade' and the soulful sound of the guitarra, click here. Saudade was certainly the word to describe my feelings when I was in a little village in Beira Baixa at Christmastime 1968. There were no TVs in Águas then but my hosts' cousins in Penamacor had one - probably the only one in that village - and so on Boxing Day we decamped for the afternoon. Everyone was eating and chatting with only half an eye on the screen when, suddenly, there before my eyes was King's College chapel in the gloaming, a vision of soaring stained glass windows and fan vaulting, and an ethereal voice singing 'Once in Royal David's City.' I could have burst into tears. Normally never homesick, just at that moment how I longed to be in England with my own traditions! That ache, that tug at my heart strings was saudade. I think a people isolated more or less from the rest of Europe because Spain was a threat to their independence, living in a country turned always towards the unreliable ocean with its storms and constant threats, is likely to be less carefree than its nearest neighbour. And that is reflected in the two guitars. To me the Spanish guitar seems like the spirit of fiesta, happier, less introverted, more frivolous perhaps than the serious Portuguese guitar with its melancholy, its longing, its yearning, its feeling of loss; in short its saudade. Of course, the Portuguese don't always play sad tunes or sing mournful songs. There are jolly folk songs and lively dance tunes but, it seems to me, that whatever is played on the Portuguese guitar always has a plaintive undertone. One of the links below will take you to a veritable tour de force of guitar playing. In the second clip, Ana Moura, a singer, puts 'fado' - the traditional songs of love, loss and yearning and Portugal's great gift to the world of music - together with the guitar. Note the kind of words in her song. For example, "Chorai, chorai poetas do meu país," which means, "Weep, weep my country's poets." Ana Moura is singing of her aching soul: the guitar is reflecting it back to us. So what is the guitarra like? What else is special about it? Well, as you can see, there are twelve metal strings in six pairs and it is shaped more like a lute than what we instinctively think of as a guitar. 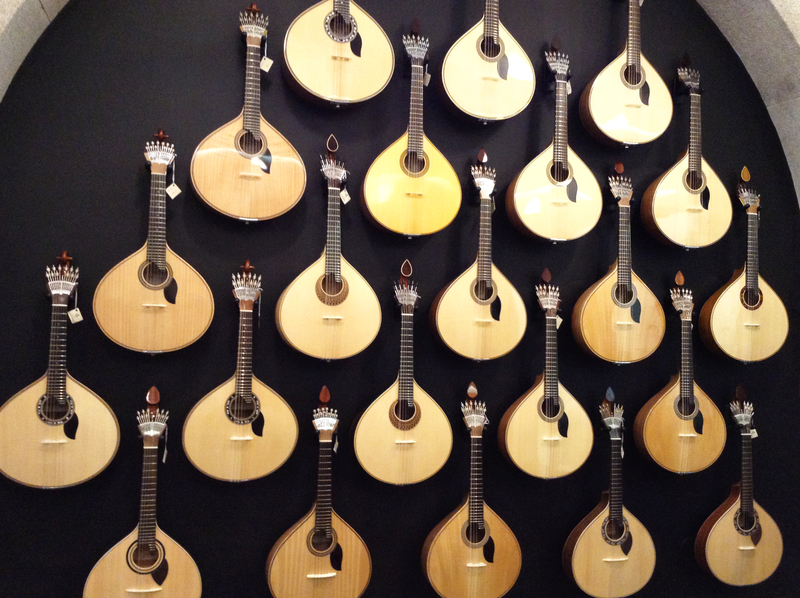 Each instrument is hand-made by a craftsman and is a minor work of art. You may note that the scroll at the top varies in design. These differences are not random; they are not even the fantasy of the maker. The design tells where they are from... or at least it used to. These three examples were all in the same shop at the end of the Dom Luis Bridge in Porto but only the middle design with the flower is a Porto guitar. The one to the left is typical of Coimbra, the one to the right is from Lisbon. This shop is wonderful and anyone who is musical and loves 'fado' will have 'saudades' for it, which is to say that they will miss it when they are far away and will long to go back and explore the instruments there. As well as the Portuguese guitar, there are many other kinds of 'guitar' of varying sizes, including the ukulele and the tiny 'cavaquinho', which, to my knowledge, has no translation into English. Last Christmas I tried to send many of you a picture of the most unusual crib I have ever seen. For reasons I can't explain, the picture did not seem to want to be transmitted. Never mind. Let me add it here, though it was in a different shop from the one I wrote of above. Joseph, Mary and Jesus; the Spanish guitar, the Portuguese guitar and the 'cavaquinho'. What do you think of the crib? Clever, isn't it? And what do you think of the soul-searching sound of the the 'guitarra'? Here are a couple of links to Youtube film clips. You are a true storyteller! I could hear the Portuguese guitars in my mind while reading the story. And what a lovely and original crib! Hi Tina, Good to hear from you. I'm glad you liked the crib. I thought it a clever, imaginative idea. Do keep on reading and commenting. I look forward to meeting up again sometime. I absolutely adore guitar, especially the Portuguese guitarra. I much prefer that element of fado to the singing! Hi Juiie, I like both though I do have to be in the mood for fado. 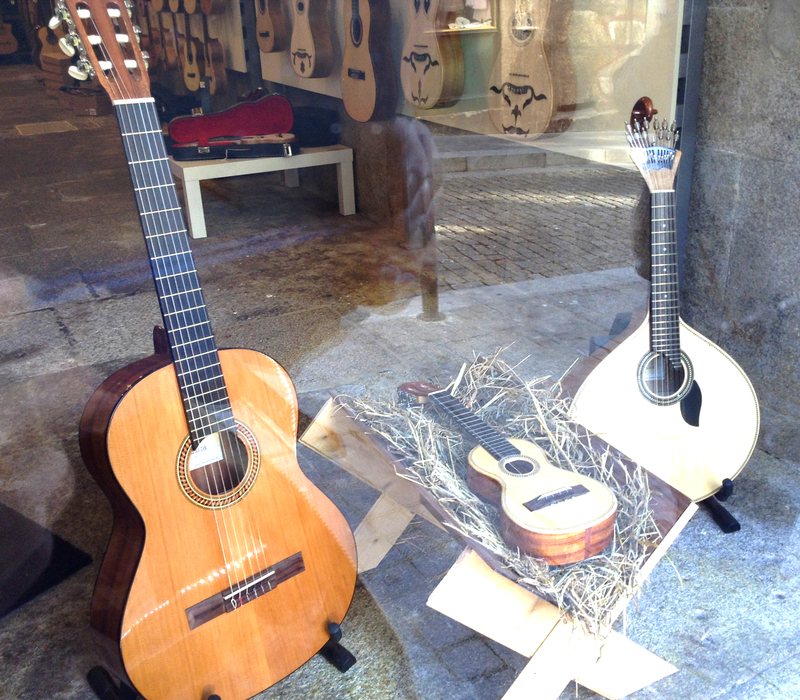 If you are in Porto, I believe you can arrange free taster lessons through the shop near the bridge and, considering the huge amount of skilled labour involved in making a guitarra, I am amazed at how reasonable the prices are.